Dandruff caused by Seborrheic Dermatitis is a mystery in the un-making. At this very moment in time scientists have not reliably identified the exact trigger cause of your frustrating/embarrassing/intensely itchy scalp condition. But what they do know is this – your scalp has lots of bacteria, fungus and mites on it. Healthy skin also has lots of bacteria, fungus and mites on it, but in different amounts. Welcome to your skin’s microbiome. An extremely complex balance of microorganisms which live in synchrony with each other to either make great scalp health or serve as a promoter of your frustrating and itchy dandruff scalp. A balance which could in theory, positively be manipulated with probiotics – live bacteria and yeast. A theory which a L’Oréal owned 2016 patent, a 2017 published clinical trial and a new probiotic strain look set to prove right. This is extremely exciting and potentially ground breaking territory. Over 50% of the world’s population are affected by dandruff caused by seb derm. A fact which means extensive funding for anti-dandruff research. Studies which will ultimately unveil new anti-dandruff approaches with improved efficacy over what’s available to you today. Your dandruff is traditionally accepted as being the consequence of an overgrowth of a fungus/yeast called Malassezia. Until recently, this was the main difference of scientific note between a normal person’s scalp and your seb derm affected scalp. Now, it’s looking like the Malassezia yeast does not work alone and that actually the cause of your dandruff looks more like a love triangle. In 2013 a study concluded seb derm affected scalps had a much higher incidence of malassezia yeast than healthy scalps, while also having a much higher incidence of a bacteria known as staphylococcus epidermidis (s.epidermidis) and a much lower incidence of a bacteria known as propionibacterium acnes (p.acnes). Take a look at this pictogram comparing the microflora of a healthy scalp vs. a seb derm affected scalp. Red shows the percent of s.epidermidis and blue the amount of p.acnes. The even more interesting bit, these 2 bacteria have a co-dependent relationship i.e. if one of them grows, the other shrinks. 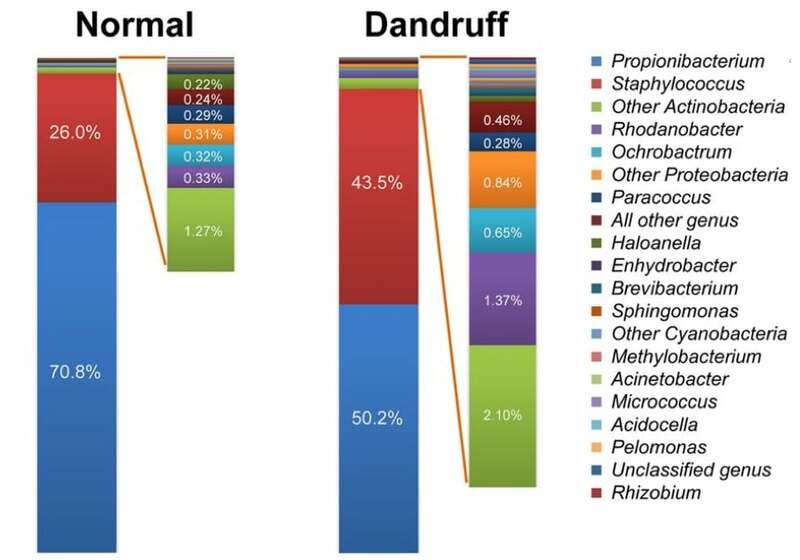 Meaning in theory if scientists could manipulate your scalp microbiome to encourage the growth of p.acnes, the higher incidence of s.epidermidis – which strongly correlates with dandruff incidence- would automatically re-balance itself and in theory – your dandruff would resolve. The question is, how do you encourage the growth of p.acnes? S.epidermidis and p.acnes have a co-dependent relationship because each one likes to live in different and opposing conditions. Once one of these strains takes hold, the metabolism of either of these bacteria i.e. what they eat and what they excrete makes your scalp a hostile environment for the other strain. Meaning, if we can make your dandruff affected scalp more appealing to p.acnes bacteria it would, in theory, swing your scalps overgrowth of s.epidermidis back to normal. Ultimately your dandruff could get better. Probiotics are currently a hot topic in the world of medicine. For years medicine has relied upon antibiotics – medicines which kill off bacteria to help fix your health. The future looks different and it’s largely because scientists now understand bacteria can be good and bad. Simply killing off an entire strain/breed/family of bacteria – how antibiotics work – can cause both immediate and long-term health problems. Evidence: Ever had a poorly tummy after taking a course of antibiotics? Antibiotics upset the delicate bacterial balance in your gut and the consequence is diarrhea, stomach ache and more. If, instead of killing off populations of bacteria, medicine could encourage the growth of good bacteria, health conditions could resolve positively with minimal side effects. Which, as you can see in the case of dandruff, could automatically rebalance an overgrowth of bad dandruff causing bacteria. Can probiotics help get rid of your dandruff? A 2016 published L’Oréal owned patent says yes, probiotics can help control your seb derm – but not in the obvious way you’d suspect. By directly replacing/replenishing good bacterial populations. Indirectly, by improving a function of general health which discourages the growth of bad bacteria and encourages the growth of good bacteria. And the 2nd route is exactly how probiotics could help get rid of your dandruff. In this instance, you’d take a probiotic. The probiotic has the effect of improving your scalps general health i.e. improves hydration. The p.acnes bacteria love scalp sebum and a high water content i.e. a well-hydrated scalp. And if you remember, seb derm sufferers typically have a lack of the p.acnes bacteria when compared to a healthy scalp. A growth of the amount of p.acnes bacteria on your scalp will, in turn, reduce your overgrowth of s.epidermidis bacteria. 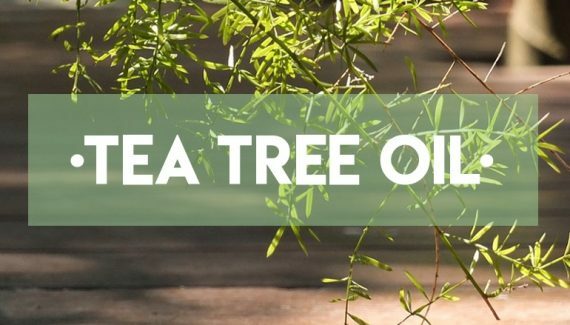 Leading to a reduction of seb derm symptoms. 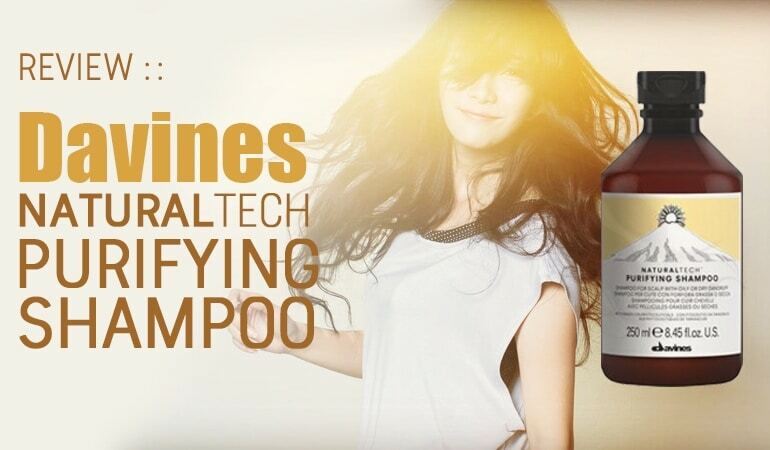 Fact: L’Oréal has found a probiotic which is capable of significantly reducing dandruff and related symptoms. A probiotic known as Lactobacillius paracasei ST11. Is this real? 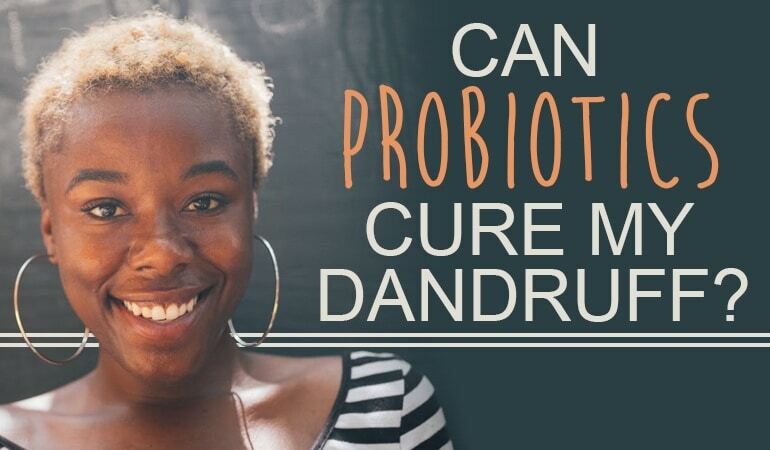 Can a probiotic actually resolve my dandruff? After years of managing dandruff with anti-dandruff shampoos, it’s logical to have doubt. Especially as a probiotic like the one L’Oréal have patented is not applied directly to your scalp but instead ingested. …And extremely helpfully, L’Oréal have tested for the exact effects a daily probiotic of Lactobacillius paracasei ST11 can have on a dandruff sufferers scalp. What a breath of fresh air – a published, open access clinical trial test with placebo control. Trust us, open access clinical trials, when conducted by industry, are not easily come by. In fact, companies are currently under no obligation to make their clinical trial data publicly accessible. L’Oréal has – which speaks very loud volumes for how successful their new probiotic has proven to be. The study, which was conducted in 2016, worked like this, 60 healthy volunteers with moderate to severe dandruff were recruited. Participants either received a probiotic sachet of Lactobacillius paracasei ST11 or a placebo i.e. a sachet which looked exactly like the probiotic but actually had only ‘sugar medicine’ in it. The placebo effect: The very thought of believing something can work is proven to have a positive benefit on health conditions. Telling someone that taking this every day will improve your dandruff can improve dandruff. The fact this trial is placebo-controlled means the study allows for this proven psychology. Over 56 days participants took either their placebo (without knowing) or the real probiotic. Now to the juicy bit – the results. After 56 days of use participants taking the Lactobacillius paracasei ST11 probiotic showed a scientifically significant improvement in free and adherent dandruff, erythema i.e. redness and itching and overall global clinical scores. Taking this probiotic can help improve your dandruff. The strain of probiotic L’Oréal has patented for anti-dandruff benefits has been known of for about 2 decades. ST11 is a go-to probiotic for regulation of a person’s intestinal immune system – over 70% of your immune system by cell count is found in your gut. A benefit which is no doubt why several studies have shown positive effects of ST11 in people suffering with allergy i.e. immune dysfunction. Fact: Your skin has its own immune system which is hugely impacted by your general health and wellbeing. Scientists believe when a probiotic like ST11 reaches your gut, it activates specific immune cells which in turn release immune system mediators e.g. cytokines into your blood stream. Cyotkines are a type of immune cell involved in the growth and differentiation of keratinocytes – a type of cell responsible for forming a healthy skin barrier. This is what scientists call the gut-skin axis i.e. your gut health impacts your skin health. Once your scalp has a healthy skin barrier, dryness and sensitivity are relieved, hydration is restored and because of this strains of bacteria like p.acnes can favorably grow. Bottom line: What happens in your gut, affects your skin. Where can I find probiotic ST11 for dandruff? L’Oréal has launched this new discovery of theirs within a joint venture with Nestle called Innéov – a brand with a focus on concentrated nutritional supplements for a host of beauty needs. ST11 for dandruff launched under Innéov as Santé capillaire DS. Update: L’Oréal and Nestle ended their Innéov collaboration a couple of years back – due to it not making enough money fast enough, however, the Inneov brand still lives on under L’Oreal. While you may find it hard to find Santé capillaire DS, you can find the bacteria elsewhere in other probiotics. For example, Innéov Duology 2 In 1 capsules, contain the exact same strain of Lactobacillius paracasei ran in these tests. It’s actually marketed as a scalp regenerating food supplement, but Inneov are still the brand. Stated dose: 1 capsule contains 0.5 x 10-9 viable cells i.e. take 2 of these capsules to make up to the potency L’Oréal proved beneficial for dandruff. Stated dose: Containing 5 Billion cfu’s over 15 strains of probiotic including Lactobacillius paracasei. Hyperbiotics uses a patented delivery system which allows live probiotics to travel through the acidic juices of your stomach relatively unharmed. This is why they claim their 5 Billion cfu’s is actually like taking 75 billion cfu’s. Estimated dose: With 7.5 billion organisms shared over 9 probiotic strains, this is very likely close to the 1 billion cfu of Lactobacillius paracasei mark. Probiotic Lactobacillius paracasei/l.paracasei has been proven to help relieve dandruff symptoms in well-controlled, scientifically designed trials. This is not pseudoscience but instead real, well-validated findings. A show of how your body cannot be treated as a collection of individual organs i.e. heart, skin, lungs, but instead how the health of your whole body is interconnected. I’ll be trying Innéov Duology 2 In 1 capsules myself in the coming months so watch out for a review. I would like to know more about this pill of probiotic.and is it available in Nigeria?